VW’s 2018 E-Golf just had its price revealed, and it’s not all that bad. Cheaper than a new Tesla, for one thing, but the bottom line here is, as always, the bottom line: This better work. And I’m not saying that just for the sake of the planet, but I’m saying it for the sake of VW. After that diesel-gate screw up, Volkswagen has got to get their act together and start selling cars, a lot of cars, or things could turn out very bad for them. Volkswagen, like a number of other European automakers, has a lot of history in diesel engines. And a lot of them, VW chief among them, were not all that interested in pursuing EV technology. They decided to put their engineering focus on diesel engines for the sake of efficiency, but a funny thing happened on the way to the emissions testing station. VW was caught red-handed faking their diesel emissions scores and got the crap pounded out of them, legally and financially speaking. Shoot, one of the corporate higher ups just got a jail sentence for his part in L’affaire Diesel. This leaves VW and any other automaker banking on diesel in a bit of a technological and political bind. With new efficiency and emissions standards looming on the horizon, car companies have to clean up their act. Which brings us to Volkswagen’s e-Golf: they better be able to make and sell these things by the boat-load. Funny thing is this just might work out. The Volkswagen E-Golf looks like a good alternative to most of the other EVs out there. Photo: Volkswagen of America Inc. The 2018 e-Golf has a starting price of $30,495, which I note is much cheaper than the hotly anticipated Tesla Model 3, and about what Nissan sells their Leaf EV for. 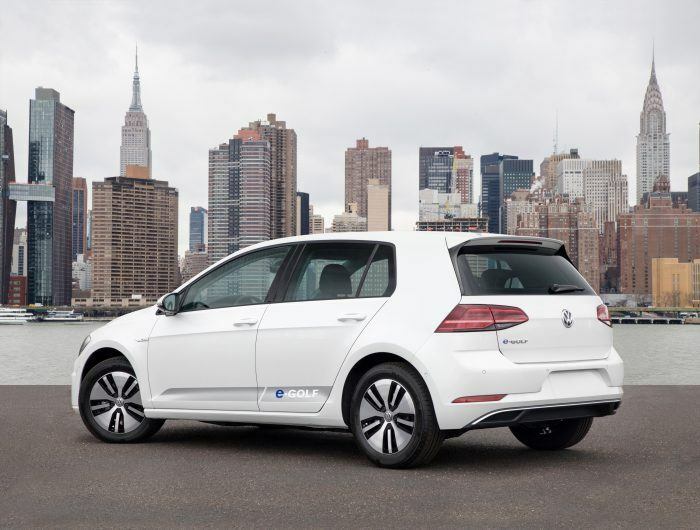 The new e-Golf gets some improvements, like a longer EPA-estimated range, better economy, and more power. 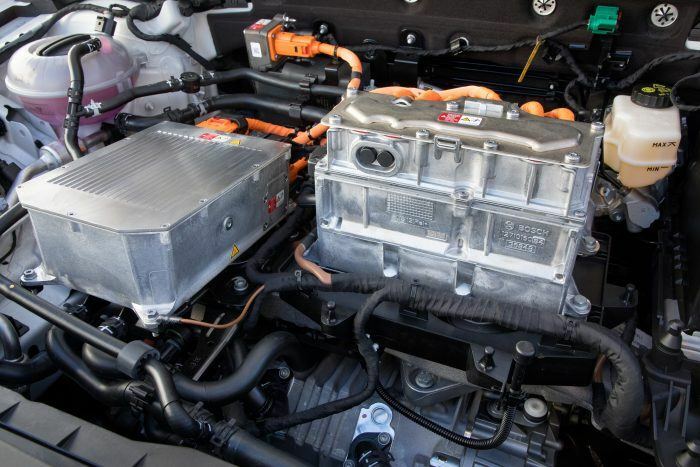 The updated lithium-ion battery improves energy capacity to 35.8 kWh, up from the previous 24.2 kWh, for an increase in vehicle range (83 miles to 125 miles on a single charge). No, Jack, it’s obviously not a road trip car; it’s aimed at around town travel. There’s also a 7.2 kW on-board charger standard on all trim levels, so you can charge the battery in less than 6 hours at a 240V station. And, when you go with the DC Fast Charging, optional on SE models, standard on Limited Edition and SEL Premium, the battery can be charged up to 80 percent within an hour at a DC fast charging station. Battery chemistry improvements raise the overall “fuel” economy to 126 MPGe for city driving and 111 MPGe on the highway/autobahn. Combined city/ highway gets you 119 MPGe. These figures are slight improvements over the previous model. All that juice is applied to the Straße via an upgraded 100 kW electric motor. It puts out 134 horsepower, a notable improvement over the previous 85 kW electric motor that put out 115 horsepower. Unsurprisingly, torque is also up, from 199 lb-ft. to 214 lb-ft., good enough to get you to 60 in just 9.6 seconds. Top speed is a lackadaisical 85 mph, but I doubt 99.9% of e-Golf buyers will care. Breaking it down by trim level, the base, or as VW puts it “value-oriented” e-Golf SE starts at $30,495. It comes with more standard equipment than the previous base model. The SE comes with an 8-inch glass-covered touchscreen display, LED taillights, cruise control, a leather-wrapped multifunction steering wheel, and the 7.2 kW on-board charger. Adding the DC Fast Charging package tacks on another $995. 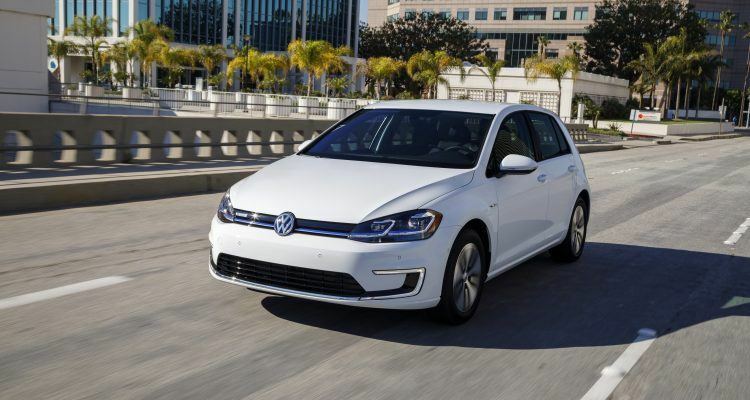 The e-Golf Limited Edition rings out at $33,795 and includes all of the SE stuff, but adds DC Fast Charging capability, V-Tex leatherette seating surfaces, and Park Distance Control (ParkPilot), along with a new feature called Maneuver Braking to “avoid or mitigate the effects of a collision with stationary objects while parking.” No, seriously. The range topping e-Golf SEL Premium will cost you $36,995 and offers an optional Driver Assistance package for $1,395. That includes a 12.3-inch Volkswagen Digital Cockpit instrument cluster, Adaptive Cruise Control, Forward Collision Warning with Autonomous Emergency Braking and Pedestrian Monitoring, Lane Assist, Blind Spot Monitor with Rear Traffic Alert, Park Assist, and Light Assist. So, there it is. It’s not exactly a Hail Mary pass on Volkswagen’s part, but they better start selling these things like crazy. Photos & Source: Volkswagen of America Inc.
No Comments on "2017 Volkswagen e-Golf Gets A Price (And It’s Not Just The MSRP)"